Dazzle them with elegant gold event d�cor from ShopWildThings. For grand galas or intimate home celebrations, shop the store that's preferred by leading event planners and production set designers. 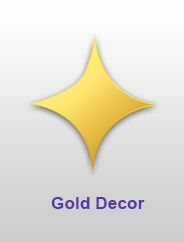 Our goldmine of gold event decor items is glitzy, opulent and ideal for classy, bold-as-gold events. Our sizable inventory will allow you to find the right quantity, whether you need a single roll of gold glitter tape or enough sparkling oversized candelabras to fill two ballrooms. Our expert on-site staff will process and ship your order fast, with free shipping available on qualifying orders. Shop dozens of choices in light gold, standard gold tone or matte gold beaded and metal chain event curtains. Our Spangles beaded curtain mixes the sheen of gold, copper and platinum for a spectacular backdrop or entrance. Our customers have discovered hundreds of Decorating uses for our diamond-facet gold bead strings by the bag. COMING SOON! String Curtain Honey Gold 3 ft x 12 ft - Polyester & Cotton "Nassau"
Roman Grecian Pillar Column Stand & Floral Riser- Gold 35"
SALE ! Real Crystal Candlestick Holder "Monza" Gold - 3 1/8"
Flower Ball - Silk Rose - Pomander Kissing Ball 6" - Gold - BUY MORE, SAVE MORE! Flower Ball - Silk Rose - Pomander Kissing Ball 8.5" - Gold - BUY MORE, SAVE MORE! SALE ! Spray, Swirly Metallic Gold Glitter, 31"
SALE - Spray, Swirly Metallic Champagne Glitter, 31"
Coming Soon! Manzanita Branch 40" Antique Platinum - 3D Paint Detail - Bendable! We carry sheer organza table toppers and runners in gold, and stunning fleur-de-lis hanging ornaments in gold, silver and champagne glitter. Browse our beautiful gold glitter hanging candelabras, antique chandeliers, beaded glass crystal candleholders and pillar columns. Our antique-look gold and white cake and cupcake holders are lovely touches for wedding receptions and other catered celebrations. Drape a room or outdoor party space with garlands of soft metallic gold faux pearls. We have holographic sprays of faux onion grass and natural Manzanita trees with real branches finished in a matte golden hue. Our tinsel wrap spiral gold metallic ceiling décor can create a dazzling effect in any room. Shop our gold-tone stools, tables and fabrics, too.